Interests:"Are you sure it isn't time for a colorful metaphor?" It was announced that Marty Abrams and Doc Mego are bringing back Mego in a big way. All will be revealed June 16! Holy crap I am interested to see how this turns out. Mego was a huge part of my childhood. Mego will always have a special place in my collecting past. For now I get my multi-property crossover satisfaction with Minimates. (Planet of the Apes, please!) They'll have to announce something pretty huge to get my money. Yeah... I can't see how just reproducing the same stuff they did in the 70's is going to sell to kids... some collectors sure. But I've basically decided to dump all my Mego Stuff... I still prefer the AA/DST line. As much as I'd love to have all my old Mego figures back, I'm not the same collector. Authenticity is pretty important to me so while the bridge crew would be fine, there's no way I could tolerate that Mugato or Gorn. Ironically, even if Mego were to correct them to make them more faithful to the source material, it'd feel like a cheat. I really feel like they missed the boat on this trend. Several companies have already made these and of course these are really just nostalgia pieces. DST got about as much as anyone could expect in a Star Trek line for these. Neca has also covered a lot of ground with this format. The only advantage Mego has is they can actually put the Mego logo on the package, but I feel like anyone that picky will insist on the original anyway. If they could bring something new and original to the action figure market while still incorporating that nostalgia I could see it working, I just don't really see what they could do. If Mego could put out a nostalgia line as well as create new figures in the Mego fashion, I think it may do well. Many people expect detail and authenticity in their figures today so it's a different world than it was in the Mego heyday of the 70's and early 80's. I am intrigued but skeptical at the same time. Maybe they don't need to offer something new and original to the action figure market as much as they simply need to offer something new and original to Mego. What if they offered an authentic replica of the bridge of the NCC-1701? Or maybe the transporter room that acts as a display for six figures with Scotty at the controls. I look at how Hasbro crowdfunded the Sail Barge for Star Wars and wonder if a Star Trek licensee might give it a try. Marty seems like a pretty cheap guy though. He's probably content resting on the laurels (and low standards) of the Mego IP. Personally my guess is they plan to do new IP's in the old Mego format. That format is apparently pretty cheap right now to produce and the bodies are obviously shared for almost every figure. I think they're thinking they can just follow the Funko Pop model and just make a whole bunch of popular characters without really committing to full lines of figures. Im personally hoping that Westworld is one of the licenses they grab for this. Game of Thrones has crossed my mind too. We do not know yet if these are going to be exactly the same as Old Mego or not. Who knows? They might have looked at Mezcos One:12 line and figured they could compete. I bet with printed face applications like SH Figurearts these things could look like Hot Toys product but on a budget! Marty Abrams is 74. I don't see him being too innovative this late in the game, especially with his track record of pinching pennies. While I'd love to see him continue what Mego started in the 1:18 scale with tighter sculpts, more elaborate paint apps, and fun playsets, I don't see him being that ambitious. As much as I'd love to have all my old Mego figures back, I'm not the same collector. This my realization and reason for redefining much of my collection. I really feel like they missed the boat on this trend. Several companies have already made these and of course these are really just nostalgia pieces. DST got about as much as anyone could expect in a Star Trek line for these. Personally my guess is they plan to do new IP's in the old Mego format. This would make the most sense. They might have looked at Mezcos One:12 line and figured they could compete. the One:12 stuff is awesome... but pricey... and what you get is pretty random... my enthusiasm for it has wanned since we didn't get anything more in the Trek space. that will be the differentiation. Mezcos One:12 can command the high prices because they brought some new detail to the game.... but honestly if they just try and follow that... I'd probably stick with the One:12 because you'll at least get some vendor constancy. 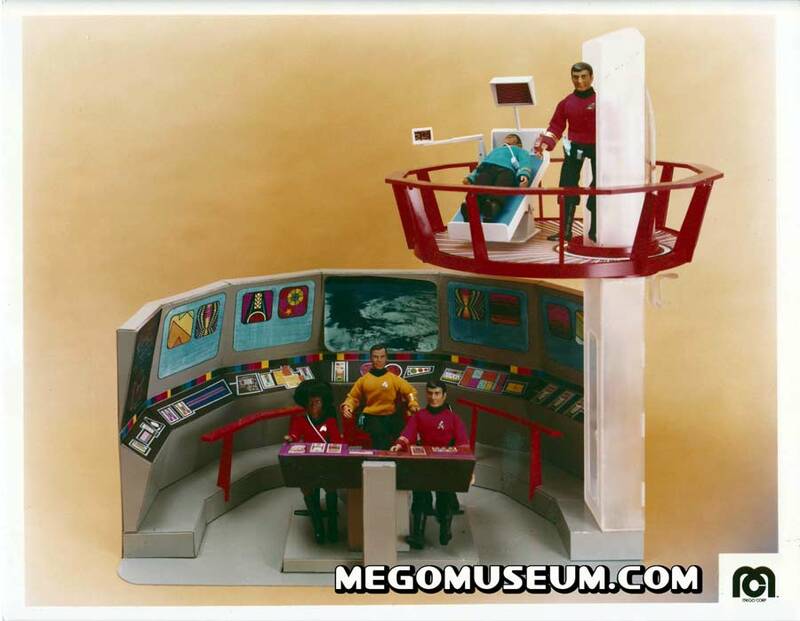 Because it seems Mezco might be done with Star Trek, Mego might be able to still attract an audience for these. I was not 100 % impressed with Mezco. Spocks likeness was out of the park but Kirk could just have easily been Andy Griffith. The dye used in the pants for all the Star Trek figures I got from Mezco transfered to all the figures and anything they came into contact with. I did not have this problem with Mezco Batman. I just had terrible luck with Kirk, Spock and Sulu. I doubt I would have tried my luck a fourth time for McCoy. I will give Star Trek another go if its for reasonably priced and hopefully updated Mego figures though. I will also gladly collect any and all Macfarlane Star Trek figures too! I think Mezco's model is put a few out in a license and see how it sells. if it flys off the shelf and sells well.. they make more... if it doesn't they move on and try something else. I agree that they seem to have moved on from the Trek License. Get thee to Target.com on July 29! Looks awesome. I am interested in seeing them but not sure how many I would buy though. I was always a fan of Toy Fare Magazines Twisted Mego Theatre I know its not DST product these new Mego figures but Id love it if Zach Oat could give us some input into potential storylines that could have happened had these new Mego characters had been announced in the late 90s- Early 2000s. I mean Captain Kirk and Major Nelson and I Dream of Jeannie! The storyline practically writes itself! Interesting. So the packaging doesn't seem very collector friendly, but if they re-issue the Romulan it could be worth picking up for the speculation alone. Still these look to be just re-issues. there seems to be a demand for originals as well as the DST re-issues. Leading with Sulu, surprising choice. I don't think this will turn out to be much more than a quick nostalgia cash grab. In fact I'm certain of it. Shame those idiots in licensing demanded conformity to the current Trek packaging style, bet they will lose sales from that. Target has had a "nostalgia" end cap for about a year now where they have several identical-to-original-issue items. From colorforms to My Little Pony, Strawberry Shortcake, Gumby, Stretch Armstrong, and more. These seem like the next offerring on the same endcap. And that packaging update will clash with the gimmick hard. Either way - quick one shot cash grab or long term project - I also think this was a dumb idea. Almost like being on Toys That Made Us got him all teary eyed and emotional (or seeing $$) and thinking the world would care again...I highly doubt enough will.